Little tiny hands and feet, the sweet smell of baby powder, the sound of a rattle - some things just remind you of a baby and some things are just for baby. Below is a selection of diaper sets, day gowns, bubbles and our version of the Baby Snuggle Up. As with all of Heirloom Treasures garments, fabrics, colour combinations and embellishments are your choice. Most of the garment samples shown here are available for purchase; please contact us for sizing on these garments. A diaper shirt is the simplest of baby clothes, designed to be worn with just a diaper to keep baby comfortable on warm days. Sugar is a tiny pink confection of polycotton batiste with a pretty smocked ruffle to frame a sweet little face and a deep pleat down the front to allow for a little "wiggle" room. A matching lace trimmed diaper cover completes this perfect warm weather ensemble. For a trip to the zoo or just hanging around the house, the Spice set will keep your little guy cool and comfy. Made of easy care polycotton, it shouldn't require any ironing, so mum can keep her cool too! All edges of the front buttoning shirt are cleanly finished with bias binding. A little applique or embroidery on the front adds another touch of "spice". The matching diaper cover has a piped front panel and legs with a three button closure on each side. Roses are in bloom on either side of center front tucks on this sweet dress for the little rosebud in your life. And those vines of tiny buds have also found their way down the center of puffed and bias-edged sleeves. At the hem of this button back dress is narrow lace edging that is echoed in the lace edged bloomer style diaper cover befitting any young blossom. Available in sizes 3m, 6m, 12m, 18m and 24m. In batiste starting at $68.00. In poly-cotton starting at $54.00. The clean simple lines of this A-line diaper shirt with short sleeves are accented by a tiny machine embroidered bunny that sits front and center atop an inverted pleat. Contrasting Madeira applique is used to create a mock collar effect and collar's shaping is repeated at the hems of the sleeves. Pin stitching is used at the hem and to accent each of the design features of this classically-styled garment. The coordinating pull-on-diaper cover has mock closures covered by three buttons at each front seam. Available in sizes 3m, 6m, 12m, 18m, & 24m. In batiste starting at $55.00, in poly-cotton starting at $48.00. Bubbles are heirloom playwear and a versatile addition to any baby's wardrobe - still suitable for photographs and special occasions (as our samples were designed for) but less limiting to baby's activities. Normally short sleeved, they can be constructed from cool cotton or polycotton batiste for warmer days or from super soft Swiss cotton flannel to provide warmth and coziness in cooler weather. The classic, simple styling of Holly (sample in white Swiss cotton flannel) makes this beautiful bubble suitable for many occasions. The round yoke collar is a perfect canvas for beautiful embroidery and is finished with tiny Swiss embroidered edging. The slightly puffed sleeves have elastic casings and a trim of wider Swiss edging. Legs have elastic casing and a snap crotch. The back has a simple placket and three button closure. Special Gifts is quite a sophisticated and tailored little bubble (sample in green Swiss cotton flannel). The embellished yoke is has set in sleeves with the sleeve bands piped in a contrasting colour. The same contrasting piping is carried over to the Peter Pan collar and the waist. The bubble has three deep pleats which allow for plenty of "wiggle" room. Legs have elastic casing and a snap crotch. The back has a simple placket and three button closure. Available in 3m, 6m, 12m, 18m and 24m. Polycotton starting at $48.00, cotton batiste and Swiss cotton flannel starting at $56.00. 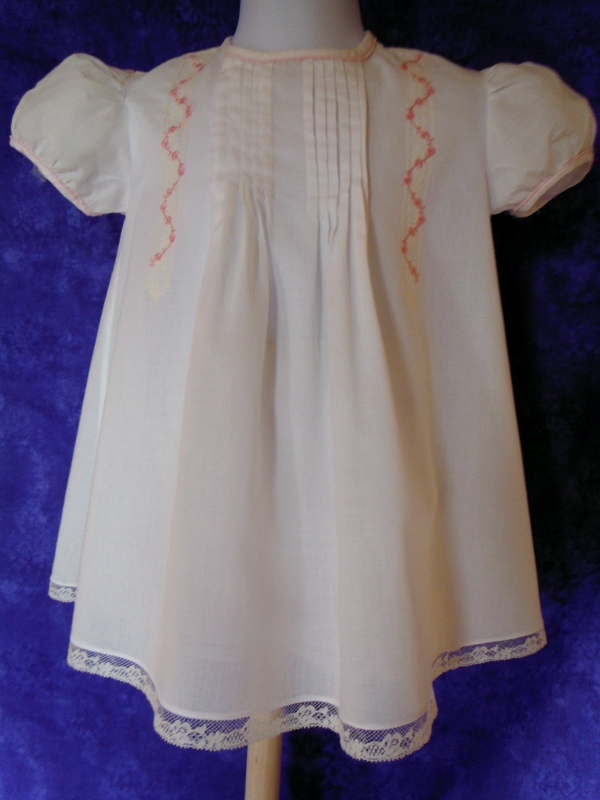 Classic heirloom baby attire, the daygown features clean lines and a polished demeanor. The easy basic style dresses up or down for any occasion by varying fabrics, colours and embellishments. Little Sweetie is an adorable outfit sure to adorn you precious little one in style. Made of easy-care polycotton, accented with Victorian embroidery and French laces and includes a full slip. It can also be made in a boys' version. Baby Bunting Bag - warm, snuggly and fashionably bundled will be the order of every winter day as you tuck your baby inside this bunting. Fashioned from soft, fine wale corduroy coupled with solid and gingham classic cottons, it zips up the front and has a half-moon hood to comfort baby's head. The hood is a combination of heirloom techniques and trims that are crowned with the machine embroidered phrase, "Snug as a Bug in a Rug", intermixed with embroidered ladybugs and flowers. And landing on the front of the bunting along with a bias-shaped flower is a larger than life embroidered ladybug joined by a border of ladybugs standing guard over your precious little one. Baby Bag - extraordinary in every way, this diaper bag will turn people's heads almost as much as the baby and mother it is created for. Its boutique combination of colours and fabrics provide accents for each and every part of the bag. End pockets, one divided in two and the other left as one, are pulled in tight with elastic casings and trimmed with a bias bow and button flourish. The long sides have rows of puffing, ribbon and beaded insertion along with machine embroidered ladybugs and flowers. All the seams are piped in a contrasting colour and the straps are an eye-catching combination of grosgrain ribbon and gingham check. Inside you'll find three more handy pockets and the whole bag can be cinched closed by way of ribbon threaded casing. Baby Jacket - warm and snuggly has grown up in this long sleeved jacket. Fashioned from soft fine wale corduroy coupled with solid and gingham classic cottons, it buttons up the front amidst a row of machine embroidered ladybugs and flowers. The edges of the jacket and sleeves are finished with piping and their hems are a combination of cotton edging and scalloped Madeira applique whose shape is repeated in the covered gimp cord embellishment. Tiny bias bows with button centers provide a finishing accent to the bottom edge of the sleeves. 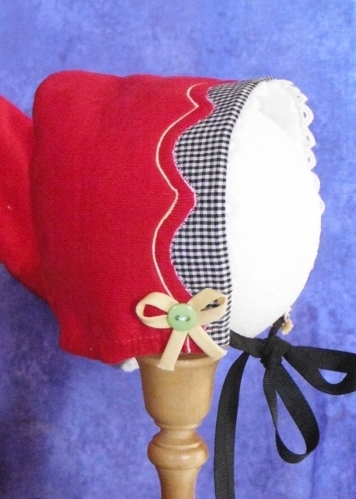 Baby Bonnet - your little one will look like they stepped out of a nursery rhyme when they don this little bonnet. Fine wale corduroy forms the crown and brim while a Madeira border of checked gingham trimmed with Swiss edging adds style around the face. Grosgrain ribbon is drawn through a casing to hold the bonnet snug and a peek at the flannel lined inside reveals a delightful ladybug and flower embroidery. The entire "Snug as a Bug" matched set is available starting at $245.00. The set includes the bunting bag, the diaper bag, the jacket and the bonnet. It's a baby blanket - no it's a bunting! The Snuggle Up is both. This beautiful and practical baby accessory converts from a blanket into a bunting through the clever placement of three buttons. Fashioned with an outer layer of vibrant cotton prints and oh-so-soft minkie type plush fabrics and an inner layer of the same plush fabric, the Snuggle Up will wrap baby in comfort and style. The Snuggle Up can also be personalized with baby's name and birthdate.